By Michael Cameron, Advocacy & Government Relations Intern, World Vision U.S.
UPDATE: The below post was published in September 2018. As of December 12, 2018, the Farm Bill has passed! Thank you for your support! Click here to join us in thanking Congress for prioritizing the fight against global hunger. The Farm Bill, also known as the Agriculture Act of 2018, is a comprehensive, multi-titled bill that comes before Congress every five years. This legislation is thousands of pages long and provides Congressional authorization of 12 titles, each of which addresses a range of agricultural and food programs. While the majority of the Farm Bill addresses domestic policy issues (including crop insurance, forestry, conservation, rural development, and the Supplemental Nutrition Program, or SNAP). World Vision’s focuses on Title III, known as the Trade Title. What is the Trade Title? U.S. Food for Peace is the largest government food aid program, providing emergency response and development programming. First implemented in 1954, this program has reached over 3 billion people. Activities supported by this program include in-kind food aid as well as local market-boosting interventions like cash transfers, vouchers, and local regional procurement. McGovern-Dole International Food for Education and Child Nutrition Program, commonly called McGovern-Dole, helps support education and food security in the developing world. Using U.S. commodities, primary schools provide food to children who attend, incentivizing enrollment — especially for girls. Nutritional teaching and training programs for pregnant and nursing women are also funded by McGovern-Dole, which helps enable sustainable academic growth. Food for Progress focuses on improving agricultural productivity and expanding the trade of agricultural products in the developing world. This program provides commodities (on credit terms or a grant basis) to spur agriculture growth in a given country. Past projects have trained farmers in animal and plant health, improved farming methods, developed road and utility systems, and other activities. What’s happened with the Farm Bill recently? World Vision has been working on the 2018 Farm Bill for over two years! In June 2017, Margaret Schuler (Senior Vice President, International Programs Group at World Vision U.S.) testified before Congress to oppose proposed cuts in spending. Many recommendations from this testimony highlighting World Vision’s Food For Peace programs in Zimbabwe and Haiti and Food for Education in Mozambique made their way into the bill. World Vision also hosted a Congressional briefing series, met with 56 offices on Capitol Hill, and signed on to four letters to Congress. These efforts have resulted in a bill that has many positive changes to Title III. With the finish line in sight, we have to make sure these efforts make their way into the final version of the bill. So where does the bill stand now? Different changes to the Farm Bill were made by the House and Senate, which means that these bills must go through what’s called the conference process. That means a special committee has been formed to hammer out the differences between the two bills. The conferees include 46 Representatives and nine Senators. Unfortunately, the Farm Bill is set to expire on September 30. And the House of Representatives is only in session for 11 days of September, meaning there is a lot of work to be done. If the Farm Bill expires, funding will be frozen until a compromised bill can be created. That would seriously impact some of the most vulnerable communities in the world. 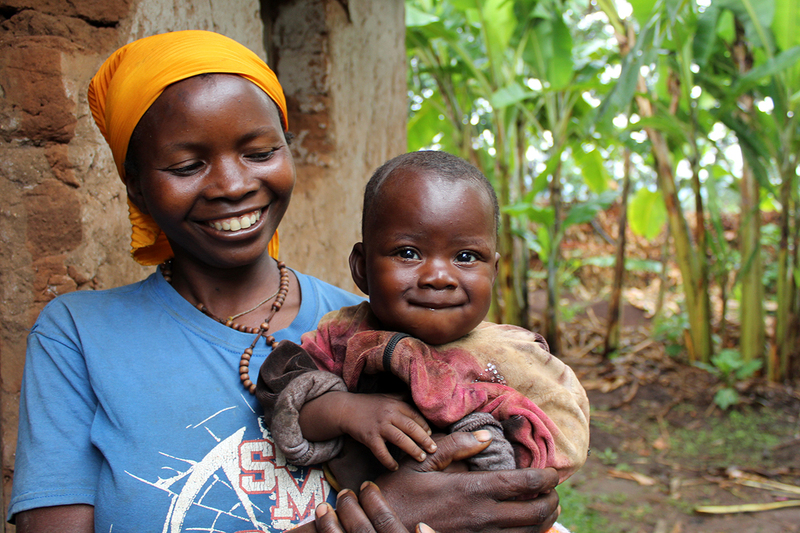 Photo: Baby Serenia’s mom Jane, 25, has taken part in a cash for work project organized by World Vision in their village in eastern Burundi. The money they’re earning is invested in their farm, along with taking care of daily needs. ©2017 World Vision, Mark Nonkes. The description of this article was “The U.S.’ focus on fighting hunger globally has helped lift more than 900 million people out of poverty since 2010.” I’ve never seen this statistic before. Where can I find the source of this? I would love to share how much our country does for the world and how we need to continue. The U.S.’ focus on fighting hunger globally has helped lift more than 900 million people out of poverty since 2010. Want to help this progress continue? I would like to get my hands on this so I can better pursue funding. This is great. Hi Steve! Thank you for your comment. I actually could not find the source for that stat, and have corrected it to say: “Over the past decade, the U.S.’s focus on fighting hunger globally has helped lift an estimated 23.4 million people out of poverty.” Read more at feedthefuture.gov.